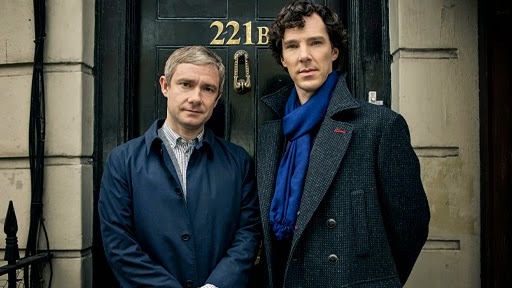 Sherlock is a British television crime drama that presents a contemporary adaptation of Sir Arthur Conan Doyle's Sherlock Holmes detective stories. Created by Steven Moffat and Mark Gatiss, it stars Benedict Cumberbatch as Sherlock Holmes and Martin Freeman as Doctor John Watson. Nine episodes have been produced, the first three of which were broadcast in 2010. Series two was broadcast in 2012, and a third series was broadcast in 2014. Mr Selfridge is a British period television drama series about Harry Gordon Selfridge and his London department store Selfridge & Co, set in the 1910s. House of Cards is an American political drama television series, developed and produced by Beau Willimon. It is an adaptation of BBC's mini-series of the same name and is based on the novel by Michael Dobbs.